I will give a full recap of our vacation for fun this weekend but I just wanted to hop on and say hello from my home in Arkansas! I made it HOME!!! I was SO happy and relieved. I really have never been so nervous as I was about losing my passport. Every time my girls or I get sick - I google it - and the next thing I know we are all dying. I lost my passport and then googled it and it said the only way for me to get home was to go to the embassy in person to the Bahamas. And the only flights I could find were $1000 and they didn't fly on Tuesdays so I would have to wait until Wednesday and fly by myself (so we didn't have to pay another $1000 for Scott) and possibly have to stay over in the bahamas by myself because there were limited flights and then come home and try to get home. And so much for all the time alone with Scott. Thankfully - we decided instead to go to the airport instead and they sent us to the local police who just had us fill out a report for $30 and that got me home. I almost hugged the Turks and Caicos police. I also happened to have a copy of my passport in my email out of extreme luck. Or God's provision - which trust me I prayed for a miracle. So they let me through customs and I was so happy to get home last night! My happy place is the beach. I absolutely love the beach. And I think I never feel closer to God than standing on the sand staring out at the ocean. When I see that vast expanse of water that seems to touch the sky - I just marvel at His creation. 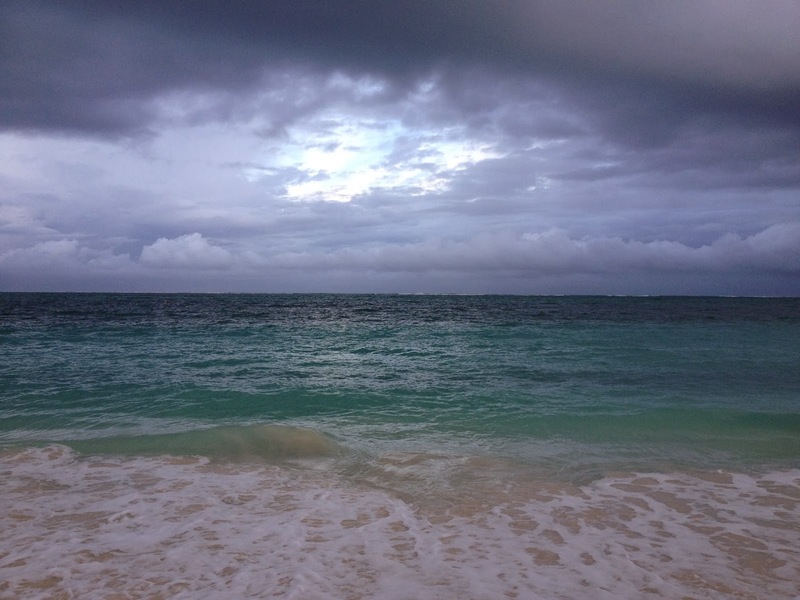 It stormed one morning and I took a walk on the beach before it really started raining and it was so dark but there was one small gaping hole that you could still see pretty blue clouds and the sun shining through. I thought it was a beautiful picture of God and how we face the strongest of storms in life and yet God's light is always there shining. We may not always see it - but it's there. I kept singing "Oceans" over and over to myself (or out loud on the beach to the embarrassment of Scott) while we are there. I love the picture this song gives me of stepping out in faith with God. If you have never heard it - you need to listen. It's my absolute favorite worship song.